The invisible wall between behind and in front of a professor’s podium may be intimidating, but professors are people, too, and there is more value in getting to know professors than simply finding someone to write a letter of recommendation. Their insights in life, both academic and professional, are valuable because our favorite professors are likely to be the people we aspire to be in the future. They have their own life stories and perspectives that offer a different type of lesson to learn, but as students, we will never hear them if we do not bother to ask. So next time you see your professor walking past you on your way to Geisel, say hello. Go to their office hours and strike up a conversation; it does not even have to be about the class. They were once just like us, stumbling along and trying to find their path in life while simultaneously growing into the people they are today. The Linguistics Department at UC San Diego is quite small compared to other departments here on campus, and it is not rare to take the same professor multiple times throughout your linguistics career. However, there is one professor, Marc Garellek, that seems to be a fan favorite among linguistics majors. After all, it is rare to find a professor that takes the time to remember every student’s name in his class. Guardian: What is your favorite thing in your office? Marc Garellek: That map there, “Endonyms of the World.” I’m kind of a geography lover, and because I love geography, I also love maps. What I like about this map is that it has the country’s name written out in one of the official languages of that country. I really enjoy it because it combines my love of language and my love of maps and geography. It’s such a shame when maps are all in English and you kind of lose some of that [linguistic] information that you could get by including all of these languages. G: f you could go back in time, what advice would you share with yourself when you were a freshman in college? I would probably want to tell myself to work as hard as I can but to make sure that I live life to the fullest and don’t let go of opportunities because I feel I have to be working, or I feel I have to prioritize my future and my present. It’s important to live and create bonds with people and have a personal life and make some choices that you will regret later on. What matters is not that you make mistakes, because everyone does. We all have to make choices in life, but when we act with integrity, we own up to our mistakes. Do you have any non-academic advice for your students that you would like to share? I think we should all doubt ourselves less and have more confidence in whatever it is we are doing. When we get overcome by doubts about a job or our personal life, we tend to not want to pursue whatever path it is that may be ahead of us. We should act just a little bit braver and try not to focus on things in our mind that are telling us that we aren’t smart enough or talented enough. When trying to reach any goal, it’s important to take that leap and to try something, no matter what the back of our brains are telling us. If you spend too much time worrying about whether you are good enough, you might miss out on a wonderful opportunity. Sometimes you have to put those doubts aside and move forward. Assistant Dean of Student Affairs, Pedro Scotto (left) and Lifestyle writer Fred Grier (right). I’ve had the pleasure of becoming good friends with Pedro Scotto, assistant dean of Student Affairs. 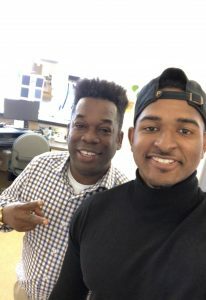 He is one of the first people I’ve come across during my first quarter here at UC San Diego who has already made a major impact on my college experience. Although this interview shines a dim light on Scotto’s benevolent personality, I highly recommend that all students spark at least one conversation with him to gain some wisdom and valuable insight on how to best prepare for life after college. Guardian: Why did you decide to do the work that you are currently doing? G: If you could go back in time, what would you tell your freshman self? P: What valuable resource does UCSD offer that very few students know about? G: They say everyone has a book in them. What would your book be about? Guardian: When you wake up in the morning, what is the first thing you do? Nancy Binkin: Well, after [my] cat has licked my face, I go down to feed the cat, and read the New York Times, Wall Street Journal and Washington Post to see what has happened overnight. NB: I just try my best to keep up with what’s going on in the world. And then I have breakfast and go over to the Young Men’s Christian Association. I go four times a week, and just the other day I went on a walk with one of my old medical school colleagues. G: Living out public health, Dr. Binkin. Okay, this question is more for me than for the UCSD Guardian it seems, but I know you lived in Italy for some time, so I’m curious; in San Diego, do you feel like the coffee is sub-par? NB: Mmm, there’s no coffee like the ones in Italy. G: That’s what I thought! NB: But you can get a good cup here and there. G: Do you have a favorite place? NB: Uh, my house? I buy my own coffee from Italy and make it in my espresso maker and froth the milk in my own frother. What I find is that here, the coffee is much stronger than in Italy, and people don’t know how to correctly froth the milk. They make it more like whipped egg whites than a wonderful creamy thing that sits on top of a good Italian cappuccino. G: That’s interesting! I’ll keep an eye out for that on my next coffee run. Any favorite places in San Diego, coffee or otherwise, you would recommend? 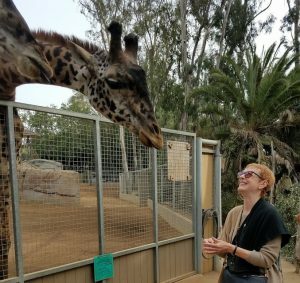 Dr. Nancy Binkin and a giraffe. NB: The downtown San Diego Safari Zoo; I work as a volunteer down there every Sunday. I work the African Rocks and Urban Jungle exhibit, and have taken some courses to get knowledge on baboons, and now giraffes and cheetahs. G: Do you feel that it’s comparable, working with us here at UC San Diego and then the zoo? NB: Ahh well it’s interesting in it’s own way. It’s nice to get people excited about new things. G: You do get to carry that mentality in both places, that’s for sure. Last question, do you have any non-academic advice for UCSD students? NB: Mmm, I’d say just make a life outside of school for yourself. Make friends with people of many different ages. It seems like everyone here takes themselves so seriously, but learn to be defined as a friend to others. Find your passions, and keep learning all your life especially as the joy of learning can get lost here. And with the intergenerational friendships, you get a depth of experiences and perspectives; it adds life to you, keeps you young. Guardian: What is the funniest mistake you’ve ever made? Dr. Jarryd Willis: I think it was back when I was at University of Texas at Austin to get my Ph.D. and I was trying to get to know someone. I was in an office talking with him, and I asked him, because I looked at the picture on his desk, “Is that you and your boyfriend there?” and he said, “No, that’s me and my dad.” He actually had a girlfriend. G: If you could go back in time, what would you tell yourself in your freshman year of college? JW: I don’t think I’d want to say anything because of where I am right now. I feel like maybe if one thing went differently, that might have been positive my freshman year. Perhaps I wouldn’t have made some of the choices over time that brought me here to California with a Ph.D., where I am now: to graduate when I was 27 years old and move here and start my life professionally, so I probably wouldn’t say anything. I think usually, when you have that question of going back in time, it’s because your current situation is one where there is some dissatisfaction. In my case, I feel pretty good about how things ended up. It wasn’t always great, but I just kind of have the butterfly effect idea in my mind, you know, Ashton Kutcher or whatever, that if you change one thing at this time point, then a whole host of things [experience the] domino effect and just change completely. If one more thing had gone right back then, I might not be here today. All right, so let’s say if whenever Jessica and I first met freshman year, October 14th, 9 p.m., there at the gym together, like our first date, so to speak. Maybe if that had actually worked out the first time, I wouldn’t have felt as much motivation to do better throughout college in the first place. Part of the reason I excelled was because she was like my rival, the person I was competing against. So we would try dating, then things would go horribly, and then [there] would be his period of animosity, then we’d date again, then we’d fall apart again. With her as a person I was kind of competing against when things were going bad, I felt more inspiration, I felt more push, more motivation to do better. She was always smarter than me. She always had better grades. I aspired to be like her, essentially, so having someone who was better than me who I could look up to as a model that I wanted to be like and to aspire to be — that pushed me forward. And that was the case whether we were dating or whenever things were bad, whether it was on or off; it was the same thing. So, I feel like maybe if that had not gone perfectly, 100 percent the first time, and it was smooth sailing, and we got married after graduation, and everything was perfect, I might not be here today. I might still be in San Antonio, Texas. G: What is one piece of non-academic advice that you would give to your students? JW: Don’t be afraid to fail and try something new. Be more afraid of not trying at all. You can always learn something if you attempt to achieve something and fail at that task. If it is something you care about doing, then even failure helps you learn more about yourself, how you can get better, and hopefully succeed the next time you try. The second thing is staying true to whatever your particular values might be and trying to be less influenced by other people. As someone who was raised in the church, dating someone who is atheist, which isn’t always the most socially polite to some, but in terms of me socially, I don’t care about someone’s religious background. I don’t care if the person is Muslim, Buddhist, Hindu, atheist, or whatever. If I like that person, then that’s it. I’m not going to let peer groups, friends, or family influence that relationship. And I’ll still keep my friends and family; they’re not going to desert me or something. So have the moral courage to stand on your convictions, what you care about, and not be as influenced by peer pressure for things that are important to you in your life. I still clearly remember the first day of WCWP 100 — everyone was awkwardly staring at each other waiting for Professor Keith McCleary to begin the generic syllabus talk. Within the first 15 minutes of class, he broke the ice by making my class yell “Keith!” three times so we could properly address him. Of all the professors and teaching assistants I have had at UC San Diego, I have yet to meet one as relatable and witty as him. If you ever take one of his classes, here are a few things you may not know about Keith and his journey to UCSD. 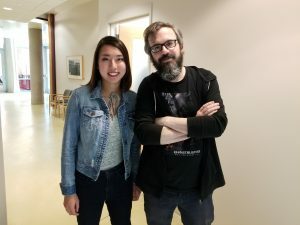 Lifestyle writer Rebecca Tsang (left) with her Warren College Writing professor Keith McCleary (right). Guardian: Where is your hometown? Keith McCleary: Livonia, New York. It’s an incredibly small town where there are no sidewalks, and there’s just cornfields behind my house. The slogan for the town is “More cows than people” — that’s real. I like visiting my parents, but I would never move back there. G: How were your undergraduate years? KM: I went to New York University for film production. I wanted to make movies, but later learned how hard it is to pursue it in the real world when you don’t have any money. Then, I shifted to do graphic design so I would get paid, and that led me into making comics in my mid-20s. G: Why did you start teaching? KM: I had this mindset where I thought people who were really good in the creative industry would become successful immediately, and even though I thought I was good, my life was not where I wanted it to be. I had also just turned 30, ended a relationship with my then-girlfriend, and was living in New York City by myself with no immediate jobs available, so I had to move back to Livonia. As I was going through that downtime, a friend of mine who had friends who worked for DC Comics in La Jolla told me to move to San Diego. I moved out here with no concrete plan in mind, and the one mildly responsible thing I thought I could do was apply for graduate school to write a novel. I began my MFA program here in UCSD and soon became a TA. I didn’t enjoy teaching when I first started, but then I realized I hated my undergrad years because the teachers I had were usually awful, and I didn’t want my students to go through the same thing. I decided I would rather be a better version of the teachers that I had, so I began investing in teaching. G: What is one piece of non-academic advice you would give to your students? KM: College puts undergrads under so much pressure, like it’s the end of the world if you don’t have your life sorted out right now. Your 20s may be horrible, but it’s fine. You will survive. Guardian: If you need caffeine, what are you drinking? Professor Goran Bozinovic: I drink beer and wine … and in that order too! I’m from a country where wine is part of the culture, so we start early. G: Speaking of getting up early, how do you start your day? GB: I like to get up early when nobody is up, which is kind of the nicest part of it. But I have a big dog so I usually sneak out with her. She’s not very friendly, so I have to find places where there are not a lot of people. Then I usually eat the same thing every day: cashew cream and gluten free cereal, because I have Celiac disease, with some tea. And then my kids wake up. 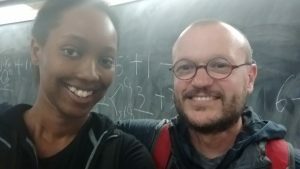 Lifestyle writer Natalie Duprey (left) and professor Goran Bozinovic (right). G: How do you spend your summer? GB: I take my kids to Croatia. My grandfather has a summer home along the Adriatic Coast of the Mediterranean, so I take them and let them loose. G: What is the key to passing your class? GB: You have to be willing to be uncomfortable. You don’t have to be perfect, but if you are doing your best and okay with being uncomfortable, I think you’re going to go a long way. I think that sets you up for later in life, and not just my class. 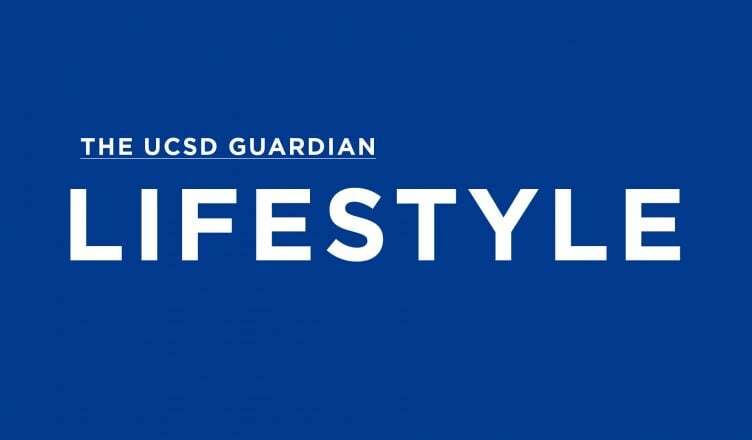 G: What’s the craziest story that’s happened to you at UC San Diego or while teaching? GB: I just made a student cry today in class, but I don’t know if that’s the craziest thing or not … but it was a good cry. I just put her on the spot! There’s this thing that I like to do, I didn’t do it to your class because there aren’t a lot of you,but in my past genetics classes, I like to start [the quarter] by teaching a different course. So if you have 350 students, I start teaching econ class, thank everyone for changing the rooms, and talk about an email notice about a swap. I go through a few slides since they might not buy my bluff. Then, they get up and awkwardly try to leave, but then I just tell them it’s actually the right class. So that’s a fun thing to do to 350 people. Guardian: What is your favorite ‘80s or ‘90s trend? Sarah Nicolazzo: Oh my God! I actually think that some of my favorite ‘90s trends have come back, which is jarring and funny. Maybe it is back, but maybe like zine making, you know. Just the idea of it, that you could just say “Oh, here’s a photocopier; I’m [going to] publish my thoughts. I’m going to make a book.” I thought there was something really wonderful about that. And maybe, like, the whole “riot grrrl” ethos, but maybe that never actually went away. SN: I would say a few things: I would’ve told myself: Don’t worry! You will make friends! And I’d also say don’t freak out too much over each assignment being perfect. It’s okay if you don’t know how to do something. It’s okay if something turns out not-ideal the first time around. That’s okay, it’s fine. You can turn in something that is just good enough. G: If you could switch places with one person in the past or present, who would it be and why? SN: So many options … I would switch places with either Anne Bonny or Mary Read, who were these 17th-century pirates. They had really interesting lives and they became sort of notorious. I would be very curious to know what it was like to be a pirate in the 17th century. G: What is one piece of non-academic advice you recommend to your students? SN: I would recommend to find something in your life that is not school or work to develop and attach yourself to. Always have something else that’s not school or work because you never want your schoolwork or your job to turn into the only thing that gives you a sense of self. It’s so important,especially [because] I’m in a job that can take over people’s lives and can be really demanding. It’s really important for me to have hobbies, do other stuff, and be different versions of myself. So yeah, it is not frivolous to have a hobby or passion or a thing you do that isn’t your job. Do that. Always do that.